I was first introduced to him like so many of you through the swashbuckling movie, The Three Musketeers. I remember reading bits of it in a high school English class and always thought I’d come back to it. Well it took some 20+ years to get back to it and I think the only reason it popped back up on my radar was because it was a book club read. After seeing so many renditions of the movie, I had serious reservations as to whether or not the book would be any good. And, they were laid to rest about a chapter or so in. 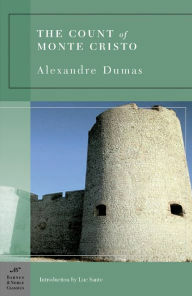 The next Dumas book on my list is The Count of Monte Cristo. Who can’t resist a novel that has a dashing young man who loses his love, is wrongfully sent to prison for more than a decade, a prison escape, a personal reinvention, and revenge? Dashing young Edmond Dantès has everything. He is engaged to a beautiful woman, is about to become the captain of a ship, and is well liked by almost everyone. But his perfect life is shattered when he is framed by a jealous rival and thrown into a dark prison cell for 14 years. The greatest tale of betrayal, adventure, and revenge ever written, The Count of Monte Cristo continues to dazzle readers with its thrilling and memorable scenes, including Dantès’s miraculous escape from prison, his amazing discovery of a vast hidden treasure, and his transformation into the mysterious and wealthy Count of Monte Cristo—a man whose astonishing thirst for vengeance is as cruel as it is just.